Cite page (MLA): Wisnicki, Adrian S., and Megan Ward. "The Final Manuscripts: Three Bonus Texts." In Livingstone's Final Manuscripts (1865-1873). Megan Ward and Adrian S. Wisnicki, dirs. Livingstone Online. Adrian S. Wisnicki and Megan Ward, dirs. University of Maryland Libraries, 2018. Web. http://livingstoneonline.org/uuid/node/d39f223d-8df4-477a-9cf2-958b7ce4a2f3. This page provides a set of short introductions to the three bonus texts included in our critical edition of Livingstone’s final manuscripts (1865-73). The page discusses the value of the three texts collectively, then provides an overview of the content and form of each individual text. The page also provides access to a hidden fourth bonus text. Our critical edition of Livingstone's final manuscripts includes three bonus texts: a two-page fragment of Field Diary XII, the full text of the second Unyanyembe Journal, and two pages notes and calculations for Field Diary XVII. Our project team has critically encoded and edited each of these texts because they complement the main texts encoded for our edition, the Unyanyembe Journal (1866-72) and twelve of the final field diaries (1865-73). We see the bonus texts as representing, in miniature, Livingstone's composition process during his final travels because the texts encompass three distinct stages of production: notes for a field diary, part of a field diary, and a journal Livingstone wrote up based on one of his field diaries. Together, these documents offer a snapshot of the final manuscripts as a whole. The bonus texts also illustrate some of the challenges in working with Livingstone’s final manuscripts. The distribution of the pages of Field Diary XII over two archives, one in the UK (two pages, included here), the other in Zambia (the rest of the diary, not included), prevents integrated study. Comparison between the second Unyanyembe Journal and the field diary upon which it is based (Field Diary XV) reveals factual discrepancies, despite the fact that Livingstone must have written the texts almost simultaneously. Finally, the fragmentary, decontextualized nature of the notes for Field Diary XVII impedes critical understanding of whether the notes embody a unique or regular stage in Livingstone's writing process during the last months of his life. Alphabetical Adventures of Livingstone in Africa for Boys and Girls (Iredale 1941:), two details. Copyright National Library of Scotland. Creative Commons Share-alike 2.5 UK: Scotland. These images glorify Livingstone the imperial icon for WWII-era children, and a key piece of that myth is Livingstone's meeting with Stanley. After sailing around Lake Tanganyika to confirm that the lake had no connection to the Nile, Livingstone and Stanley left Ujiji (pictured at left [top in mobile]) and traveled to Unyanyembe where Livingstone parted with Stanley and entrusted the original Unyanyembe Journal (pictured at right [bottom]) to the latter. Later, Livingstone also composed the single page of the second Unyanymebe Journal in the town of the same name and, apparently, left that second journal there in the unrealized expectation that he would return to it one day and copy over further entries from his field diaries. 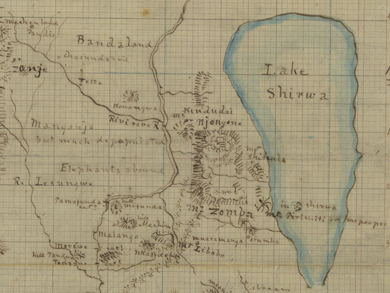 The fragment details a short period in Livingstone's travels as his party journeys in central Africa between Lakes Moero and Tanganyika en route to Ujiji. The fragment takes up topics that surface throughout the final field diaries. For instance, Livingstone complains of his inability to obtain food on Christmas day. He records rumors that have reached him in his present location by way of Ujiji. He reflects on and describes the country around him as he travels. Finally, he mentions the beating of a slave who tried to escape and notes his disagreement with some Arab traders as to the current day of the week, a problem that would resurface when he came to write the 1871 Field Diary. The fragment resides at the Wellcome Library in London and consists of a single leaf over which Livingstone has written in pencil on both sides. It appears that Anna Mary Wilson, Livingstone's youngest daughter, removed this leaf from the field diary and gifted it to Edith Kerr on 31 July 1886 (another insight into the preservation of Livingstone’s manuscripts initially as souvenirs rather than documents). The project team did not examine the rest of Field Diary XII, which resides at the Livingstone Museum in Zambia, but the shape and size of this leaf plus the documentation in the Livingstone Catalogue (Clendennen and Cunningham 1979:276) indicate that Livingstone used the same kind of flip-top Lett's notebook for this diary as he did for Field Diary XIV. The fact that the entries here correspond to the final page of the first volume of the Last Journals (Livingstone 1874:358-60) may be of significance. When Henry M. Stanley parted with Livingstone in March 1872, the former took away the original Unyanyembe Journal (1866-72) for transport to Britain. Livingstone remained at Unyanyembe awaiting men and supplies that Stanley had promised to send. These arrived in August 1872, shortly before Livingstone began the second Unyanyembe Journal. This journal, therefore, opens with a short note from Stanley describing some of the ammunitions sent to Livingstone. The presence of the note suggests that Stanley sent the journal to Livingstone in the first place. The rest of the journal (one page) consists of a series of dated entries that Livingstone has copied over from Field Diary XIV (see Livingstone 1871n:-). In these entries, Livingstone describes his preparations for departing from Unyanyembe. He notes distributing his goods for transport among his men and records the challenge of getting additional carriers due to a local conflict. He also describes hearing of a remedy (that originates from India) for jungle fever. The cover (left; top in mobile), spine (center), and a blank page (right; bottom) from the second Unyanyembe Journal (Livingstone 1871n:, , ). Copyright David Livingstone Centre. Creative Commons Attribution-NonCommercial 3.0 Unported. Had Livingstone lived to return to Unyanyembe to update the journal, the blank page would presumably have been filled with text. The page closes with a reference to the misbehavior of a soldier. This misbehavior leads to violence with the headman Manna Sera and, finally, the following response from Livingstone: "[I] called all hands and made each give [the soldier] a beating - some were too gentle and I laid my stick on their backs" (1872i:). The page thus captures elements of the circulation of knowledge in east Africa and routine facets of organized African travel, but also reveals how the associated violence could draw in or even be spurred on by explorers like Livingstone. The second Unyanyembe Journal, like the first, is a large-size bound volume, although this second volume contains significantly fewer pages. The page of Stanley's text is in pencil, while the page of Livingstone's text contains entries in both brown and black ink, suggesting that the latter copied over his entries here in at least two installments. The volume also contains a single newspaper clipping in printed Chinese text. The project team has not translated the text of the clipping, and it is not clear who added it to the journal or under what circumstances. The remainder of the pages are blank and without distinguishing features (only a few sample blank pages have been imaged for the present edition). That the entries end with Livingstone's departure from Unyanyembe and that the volume is in relatively pristine condition together suggest that Livingstone left this journal, along with the goods mentioned in the entry for 18 August (1872i:), in Unyanyembe and planned to update it with further copied over field diary entries at some future date. The journal remained uncatalogued till it turned up at the David Livingstone Centre during preparations for LEAP, the Livingstone Online Enrichment and Access Project, in the early 2010s. Livingstone produced these notes and calculations in the final days of his life. The three dated entries detail the efforts of Livingstone and his party to traverse the marshes near the Monikazi River in the vicinity of Lake Bangweolo. The narrative captures the immense challenges the party faced during this period due to the inhospitable terrain: "went East & lost our way in stiff grassy prairies which could scarcely be got through = in 5 hours" (1873a:). The addition of two local guides fails to improve matters as the water remains "about 15 inches in spots and thigh deep in others." However, even amidst such troubles Livingstone still documents some of the local flora: "Papyrus arum = wild rice & stiff grasses aquatic" (1873a:). Notes and Calculations for Field Diary XVII, 7-9 April 1873 (Livingstone 1873a:). Copyright David Livingstone Centre. Creative Commons Attribution-NonCommercial 3.0 Unported. The printed text here includes part of an address that Roderick Murchison delivered to the Royal Geographical Society in 1870, as printed in a proof copy of the society's Proceedings. Two years earlier, Livingstone wrote the Letter from Bambarre and a handful of other 1871 letters over pages from another issue of the Proceedings. The fragment consists of a single leaf. Livingstone has written wholly in pencil, over the recto and verso of a single page of a proof copy of the Proceedings of the Royal Geographical Society (cf. Murchison 1869-70:327-28). The underlying text is part of the annual address the Roderick Murchison delivered to the society on 23 May 1870. Elsewhere in the printed copy of this address Murchison discusses Livingstone's travels and notes that the latter has not been heard from in nearly a year (1869-70:329-31). The dating of the proof suggests that Stanley delivered it to Livingstone. One side of the leaf (the side with the printed text) contains only Livingstone's calculations. The other side contains two columns of notes (chronologically, the first column is in the center, the second column at left) plus some more calculations. The narrative passages here reappear in considerably revised and expanded form in Field Diary XVII (see 1873b:-). Like the second Unyanyembe Journal (see above), this fragment remained uncatalogued till it turned up at the David Livingstone Centre during preparations for LEAP, the Livingstone Online Enrichment and Access Project, in the early 2010s. Clendennen, G.W., and I.C. Cunningham. 1979. David Livingstone: A Catalogue of Documents. Edinburgh: National Library of Scotland for the David Livingstone Documentation Project. Iredale, S.E. 1941. Alphabetical Adventures of Livingstone in Africa for Boys and Girls. London: Livingstone Press. 5.95. National Library of Scotland, Edinburgh, Scotland. Livingstone, David. 1868b. Field Diary XII. 14 Apr.-10 Nov. 1868. On display. Livingstone Museum, Livingstone, Zambia. Livingstone, David. 1866-72. Unyanyembe Journal. 28 Jan. 1866-5 Mar. 1872. 1115. David Livingstone Centre, Blantyre, Scotland. Livingstone, David. 1868c. Fragment of Field Diary XII. 24-28 Dec. 1868. 67551. Wellcome Library, London. Livingstone, David. 1871n. Field Diary XIV. 14 Nov. 1871-14 Sept. 1872. 1130. David Livingstone Centre, Blantyre, Scotland. Livingstone, David. 1872i. Journal ["Second" Unyanyembe Journal]. 14-24 Aug. 1872. 963. David Livingstone Centre, Blantyre, Scotland. Livingstone, David. 1873a. Notes and Calculations for Field Diary XVII. 7-9 Apr. 1873. T0317. David Livingstone Centre, Blantyre, Scotland. Livingstone, David. 1873b. Field Diary XVII. 9 Apr.-28 Apr. 1873. 360. David Livingstone Centre, Blantyre, Scotland. Murchison, Roderick I. 1869-70. "Presentation of the Royal Awards (At the Anniversary Meeting, May 23rd, 1870)." Proceedings of the Royal Geographical Society 14: 279-332.